Finally, our hard work has been paid off as we are happy to announce the support of oeHealth for the latest Odoo version 12. The new Odoo 12 supported versions have been already released on oeHealth Store and Odoo App Store for all three variants of the product: oeHealth, oeHealth Extra Addons & oeHealth All In One modules. We are tirelessly working on adding support for oeHealth Extra Addons 2 module to Odoo 12 and aiming to launch that package at the end of this week. 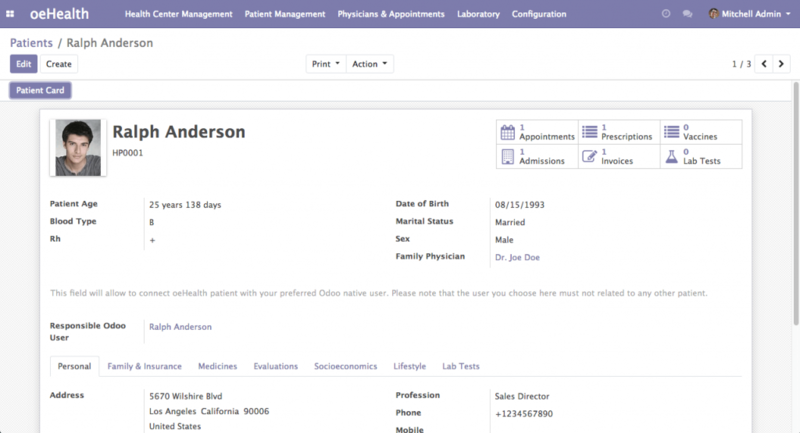 oeHealth layout has been completely adjusted to support the full-screen view of Odoo 12 Community Edition design. Tight integration with Odoo 12 API which makes the software works efficiently and faster compared to previous versions. Since it’s inception from 2014, oeHealth becomes widely popular and most downloaded commercial Odoo Hospital & Medical Management applications around the globe. We are very proud to continue this wonderful journey further with additions of Odoo 12 supported modules. Flat 15% discount is available for all Odoo 12 supported modules starting from January 16, 2019 for a limited time period. Visit our store page to get more details about the products. This entry was posted in oeHealth News and tagged emr, health, hms, hospitals, medical, odoo 12, odoo12, oehealth.